Opinions on this challenge coin mockup? Discussion in 'General Topics' started by K ALL IN 9, Aug 11, 2012. A few weeks ago i was asked to design a t-shirt for the base-wide "viking challenge." It was basically a 24hr fundraiser in which one of your team members had to be on the track running or walking. I ended up with a simple design that was completely hand drawn. As a 2T2 our nicknames are "port dawgs" which is where the bulldog comes from. The front shows the crest of the state of Germany we are located in: Rheinland Pfalz. obviously the bulldog isnt a part of the state crest the other version shows the American and German flags incorporated into the crest. 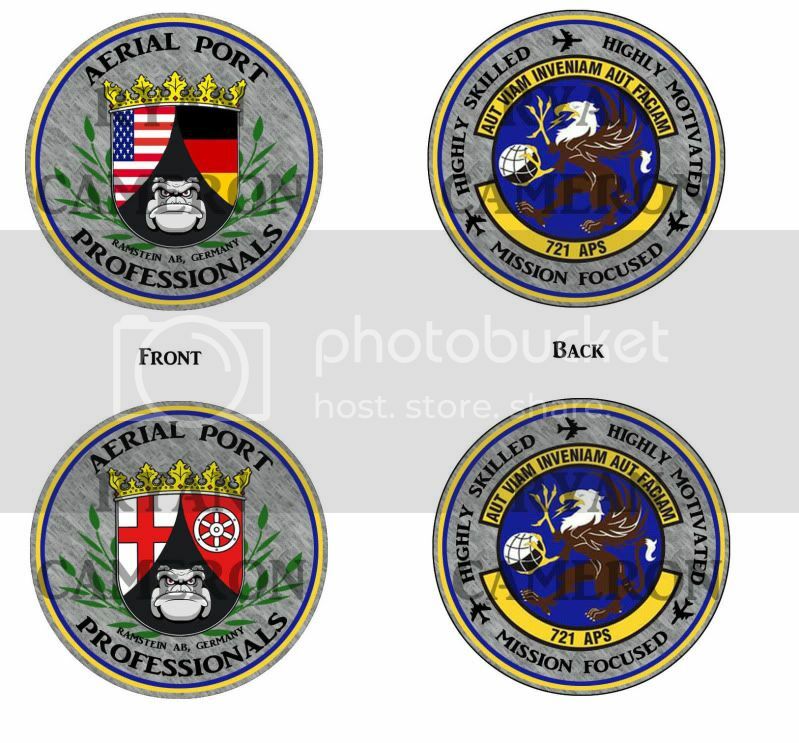 the commander wants the "highly skiled, higly motivated, mission focused" and "Aerial port Professionals" so those definitely have to be part of the design. The back shows the squadron logo. you can see the main colors are blue and yellow so i added those as a border to the front and back. Re: Opinions on this non poker mockup? 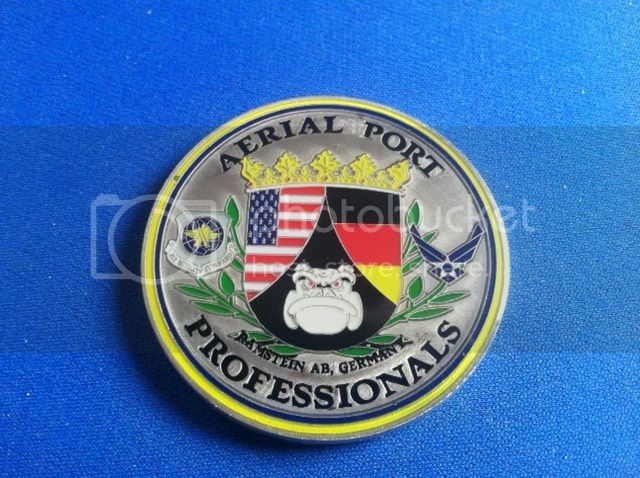 What is the purpose of the challenge coin? - Sorry if this is something that should be obvious. Right now it just seems like something for your group in squadron at this base, but does it have a deeper association with an event? What did the previous version look like? 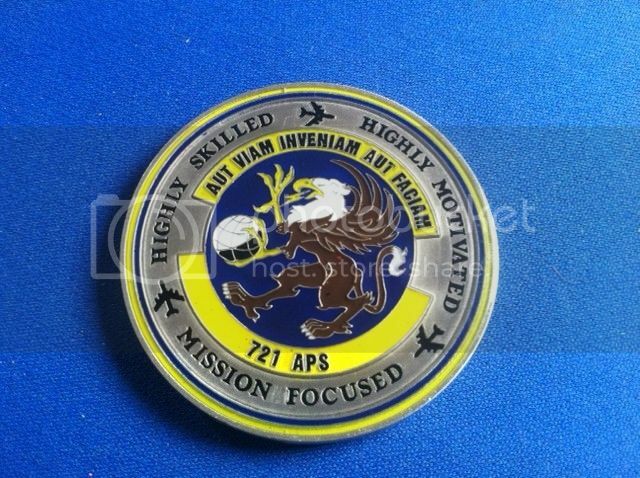 a challenge coin is usually given out by senior leadership for doing a good job. Kinda like a really fancy pat on the back. but this particular one is just a coin to represent our squadron. The one with the crossed bones caught my eye. Hate the paw prints. Reminds me of tattoos on a stripper... (not that I'd know personally!) Love the flag elements. It's just different enough to be sort of a secondary to the first one, but not too close as to be a copy. Do you know what kind of metal base they'll be made on? I say go with the bones and ship it. Second choice would be to add the bones to the front of the one on the bottom left. Its been months since this thread has been updated, but the coin went into production sometime during the winter and now its finally here. the 5/6 Council (made up of Staff and Tech Sergeants) voted on which one they liked the best and this is the one that won. 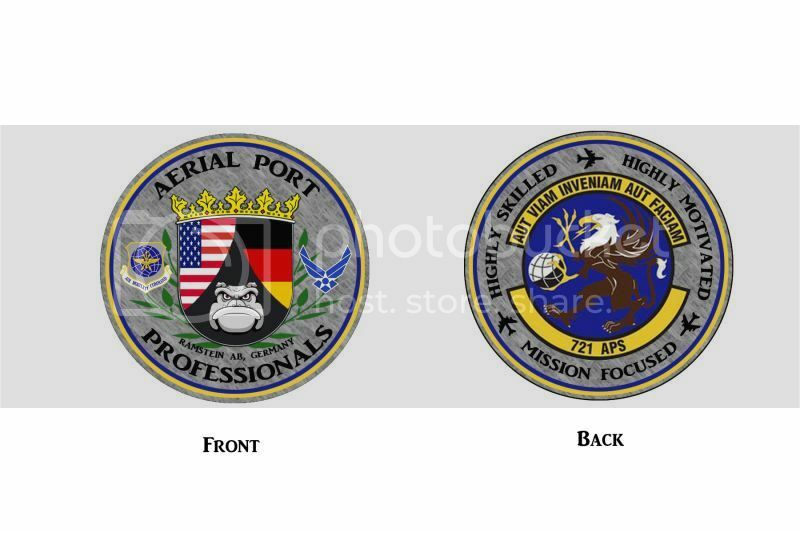 On the right, the AF logo, and on the left the Air Mobility Command logo since thats the MAJCOM we belong to. Excellent choice, and great execution. Very nice! It's funny that you posted this today. I was just looking on Ebay for challenge coins yesterday, deciding that I wanted to pick up a few. Any chance you could get me one of yours? Very nice coins, but let me guess, a new O-5 came in and decided he/she didn't like what the last guy had in place so they scrapped the existing coins to get him/her new ones?